There are a few simple ways to ensure retirement happiness, says a recent survey, but clients cant do it alone. There are a few simple ways to ensure retirement happiness, says a recent survey, but clients can’t do it alone. When you meet with your clients for your annual review this month or next, bring something new to the table. Ask them if they’ve heard about recent research from New York Life that reveals the secrets to a successful retirement from the experts – those living in retirement right now. 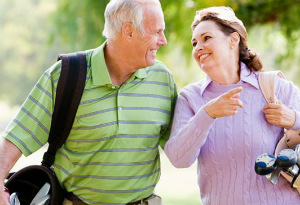 The study surveyed retirees age 80 and older on what advice they’d give to younger investors. In a time when there’s more pressure on individuals to create their own secure retirements, advice like this has never been more critical. And the importance of access to an expert who understands the complexities of retirement planning and the options available has never been more profound. Your clients will look to you for some how-to’s. Here are four secrets to a happy retirement, straight from the 80-something crowd, and worth sharing with your clients. Sixty-eight percent of retirees surveyed said financial well-being was the most important factor when it came to deciding whether they were ready to retire. This is counter to what we typically think of as retirement triggers; factors like age and health ranked lower than financial readiness. We expect the importance of financial readiness to be magnified among individuals retiring today and in the next few years given the additional pressure to safeguard retirement on one’s own. Use this insight as a reason to make financial health a priority for your clients in 2016 and to offer some ways to get financially ready to retire. Talk with your clients about how adding guaranteed sources of income can make them feel more confident about retiring when they want to. 2. Don’t underestimate your lifespan. Fifty-four percent of respondents said they didn’t expect to live so long. But not accounting for a long retirement can derail even the most well thought-out plan. So how long should you plan for? Current annuity mortality tables indicate a 75 percent chance of at least one member of a 65-year-old couple living to age 90. So planning for a 25 or 30 year retirement isn’t unreasonable, it’s smart. How do you turn the challenge of a long retirement into an opportunity? Give your clients a solution that helps eliminate longevity risk. Traditional pensions used to do that; today, clients can consider options like income annuities to create their own pension-like stream of income. 3. The early years are the best. While it’s important to plan for a 30-year retirement, don’t neglect the importance of the early years in retirement. Nearly half of respondents said that their best and happiest year was within five years of retiring, with nearly three quarters saying that the earliest years were some of their best years. This makes sense, since this is when individuals are likely at their healthiest and are the most confident about their ability to make their assets last throughout retirement. Recent research from the Employee Benefit Research Institute found that nearly half of retired households – across all income levels – spent more than they did just before retirement, with more than a quarter spending 120 percent of their pre-retirement spending. This is good reason to talk with your clients about how much they expect to spend in retirement, especially in the early years. Putting the right strategies in place – things like guaranteed income streams and income diversification – can help you can both feel confident that they’ll have the ability to enjoy the early years of retirement without sacrificing their financial security later in life. 4. Get your income on autopilot. Nearly 9 in 10 80-somethings advised younger investors to recreate pension-like income for their retirements. More than half say that, in retrospect, their own sources of auto-pilot income have given them greater peace of mind than those they’ve had to actively manage. And many respondents wished they had more auto-pilot income sources – 45 percent say they wish they had a pension, while nearly 4 in 10 say they wish they had an income annuity. We call this “pension envy;” not many people have one anymore, but almost everyone wishes they did. The reliable, steady payments just can’t be beat. It turns out that the best advice you can give your clients is to listen to their elders and to come to you for the financial solutions that will give them the freedom to maximize their lifestyle in retirement.